Follow these instructions for setting up the printer. Unbox. Unbox and remove all blue tape that secures the various components of the printer. Remove Plastic Film. There is thin plastic film over some surfaces of the printer. It’s a good idea to remove this plastic film. You’ll likely overlook some of it since it’s very clear. Important: There is think plastic film on the adjustable paper guide for the document feeder. it’s important to remove these because if you don’t, the film may get stuck in the document feeder input and wheels, causing it to jam. Power. Connect the power cord. Internet. Ideally you’ll want to have the printer connected to the Internet using an Ethernet cable instead of wireless. This requires that you have a router with an available data port. The reason you’ll want to connect through your local network instead of using USB is because the printer features are enhanced by accessing the web. Updates to the printer’s firmware are possible with an Internet connection. The printer is referred to as a ‘wireless’ printer and there may not be any mention on the box of Ethernet network cable connection capabilities. You’ll find a yellow ‘plug’ covering and protecting the Ethernet jack on the back of the printer. This is to ensure that people don’t put the fax telephone line into the Ethernet jack/port. Paper. Install some paper in both paper trays. Configure. Follow the on-screen configuration steps choosing language, region, and time. Ink. You’ll be prompted to put in the ink. The ink goes inside a door on the front left of the printer. There is a set of four ink cartridges and another set of three ink cartridges (color only). The set of four ink cartridges includes the three color ‘setup’ cartridges. Use these when initially setting up the printer. On the box in the store, it may not indicate that there are a total of seven ink cartridges total. Calibrate. After the ink cartridges are installed, close the door and follow the on-screen instructions for printer calibration. Adjust Display. The printer display screen is adjustable from flat to about 50 degrees. When it’s adjusted properly it’s clearer and easier to see. Continue below when prompted to connect and install the software. Download Software. You’ll be prompted to go to the following website to connect the printer and install the software: http://www.hp.com/eprint/ojpro8630. That link will automatically forward you to this page https://123.hpconnected.com/activate/woobe/ojpro8630. When you click on the Download button, you may be told that the download isn’t working. You may need to try again. Alternatively, you can go to the printer product page on the HP website. Click on Software and Downloads, then click the Go button. As of 25 July 2015, the software was at the 12.32 version released on Oct 17, 2014. Install Software. Once the software is downloaded, double-click the installation file to begin the installation process and follow the instructions. For Apple computers, the download will be a DMG file. Open that file. Within it will be a puzzle piece icon named HP Officejet Pro 8630. ReadIRIS Software. You’ll also find another icon named Readiris Pro 14 for HP on the . The Readiris software is for OCR (optical character recognition). This allows you to save PDF files that are searchable. When you click the icon, you’ll be taken to a page that has an ftp download link for the Apple Mac software or you can also get the Windows version of the software. Printer Connection. When you’re installing the printer, at some point you’ll be given a choice to select an IP connection or a Bonjour connection. The Bonjour connection may be more reliable if the printer IP address changes. When you’re at the point of adding the printer, from the Use: dropdown menu, choose HP Officejet Pro 8630 e-All-in-One. AirPrint may have been selected by default. Register. Register the printer when asked to do so. Create an HP Account. Setup an account with HP. Automatic Ink Delivery. The final step of the installation will be to signup for automatic ink replacement from HP. This service offers printing fees at costs from 3 cents per page up to about 6 cents per page. With the service you don’t need to purchase ink. Instead, HP will ship ink to you when the printer needs it. The advertising indicates that you’ll save hundreds of dollars per year. However, if you look up the cost of the high capacity black ink cartridge, it’s about $37 for a yield of about 2,300 pages. That’s about 1.5 cents per page if you choose black only printing. Color XL cartridges are about $30 each ($90 total) and yield about 1,500 pages (6 cents per page). The cost per month for the automatic ink delivery subscription remains the same whether you print or not. There is the option to have ‘rollover’ pages, but that’s limited to your subscription level. During the setup of your printer, a page will be printed with instructions on setting up your printer with an HPConnected.com account. You can go to HPConnected.com and choose Devices > Add a Device to add your printer to the account. Then you’ll be able to share the printer with anyone, and print from anywhere. The most economical solution for purchasing ink is to buy the four pack of high capacity (XL) ink cartridges for $117 from Amazon. These are estimated to yield 1,500 pages of mostly color, or 2,300 pages of black ink printing. Using the economical configuration suggestion shown below, your yield may be higher. For most printing, color ink isn’t needed. 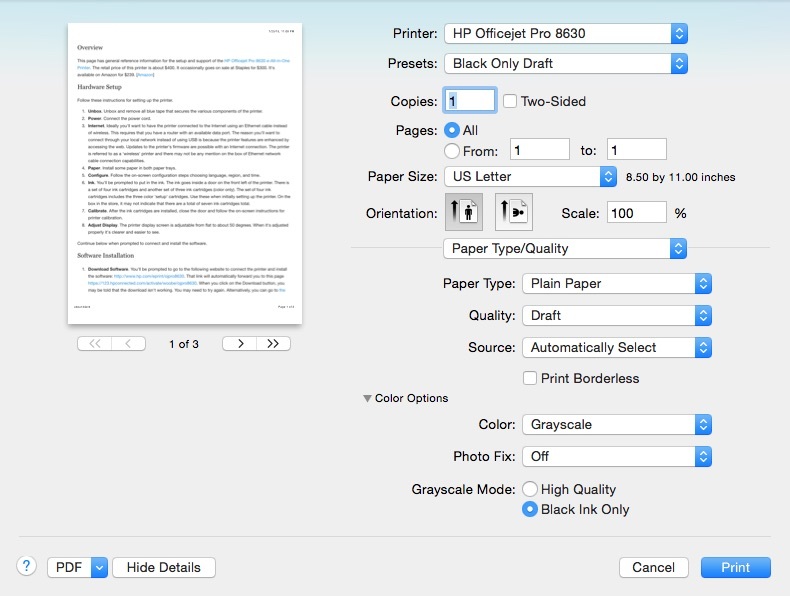 To save money and increase print speed, choose to print in draft mode with grayscale using black ink only. You may need to click the triangle next to Color Options to have additional options shown. You can save these settings as a printing preset (see the dropdown menu next to Presets). Below is an example from the Apple printing dialog. For Windows you’d look for this under print settings. Click the image below for a larger view. Below are some product photos. As our world is moving more to digital storage rather than paper storage, old method of filing are less in demand. However, one product that can be quite useful is the SAFCO Wire Mobile File cart. It’s designed to hold hanging files, but if you put the metal wire shelf on the top instead, it works great as a printer stand or moveable surface for other office equipment and supplies. Two Shelf Model. It’s currently available on Amazon in black for $55 or in silver for $60 in a two shelf design. Three Shelf Model. A taller version (shown below) is available with three shelves that’s actually designed as a printer or equipment stand. Here are the product details. Click either image below for a larger gallery view. If your iPhone mysteriously can’t find your FitBit One activity tracker, you may think it’s your phone, and you might try restarting the phone, resetting the phone entirely, removing the software, or some other method of fixing the problem. However, there’s an easier and quicker solution worth trying first. You simply need to restart the activity tracker device, and you’ll very likely discover that everything starts working again and the phone will recognize the device again. There are unique steps for each device, but generally you’ll want to plug it in, and then press and hold a reset button or action button for about 3 to 10 seconds (depending on the device). Follow the instructions linked above for your particular unit. Setting your device to synchronize throughout the day can help you ensure that your steps and activity will be uploaded regularly. Then, if the unit fails at some point, you won’t loose an entire day’s worth of data. You’ll just be without the data from the time that it failed. Plug your One tracker into the charging cable, making sure that the gold contacts on your tracker align with the gold contacts in the inside of the charger. Hold down your tracker’s button for 10-12 seconds. So, if you’re traveling to someplace other than a big city, and aren’t a Verizon customer, plan on being without Internet during your travels and when you get where you’re going. 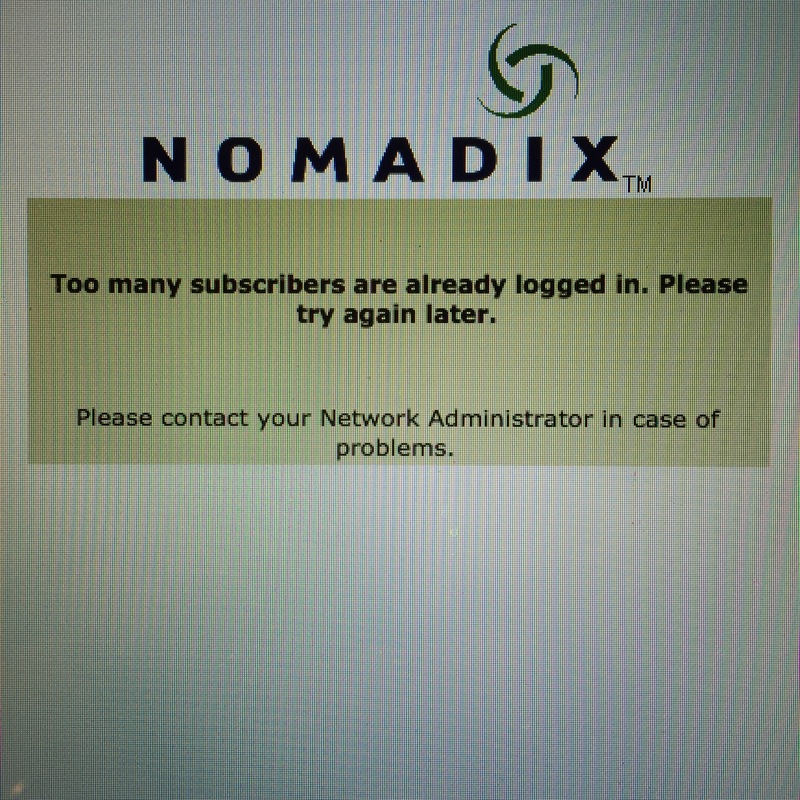 Don’t expect to rely on your hotel’s WiFi service because it will probably be very slow or inaccessible (as shown below). Need to meet a deadline or catch up on important emails? Sorry. Better luck next time. Your best option is to travel with a Verizon MiFi 6620L Jetpack 4G LTE mobile WiFi hotspot (shown below). This will allow you to get data services such as GPS mapping updates and look up important information on the internet. You’ll also be able to make phone calls using Skype, Hangouts, or a similar VOiP (voice over IP) service. Companies like AT&T and Sprint offer lots of shared data and typically lower monthly prices, with relatively good signal coverage in most cities, but they don’t cover rural or remote areas well. This is because they’ve not invested in the additional tower placements (therefore the lower monthly bills). Verizon costs more because they provide service in bigger cities as well as in rural and remote areas. They’ve invested in more tower locations nation-wide. A hybrid service model will save money while giving you the services you need when you need them. In other words, rather than paying higher monthly fees for Verizon’s amazing national coverage year-round, pay for it only when traveling (unless you travel all the time or live in a rural area). Then, for your year-round phone service, get a lower priced local service provider. The cost of a mobile hotspot is a $200 one-time purchase price (with no contract) and then $50 for 5GB data during any month you’re planning to travel. Other data plans are also available. When you’re not traveling, you can set your Verizon service to dormant and not pay anything until your next trip. There are other lower cost mobile hotspot devices, but they work only with 4G and won’t provide service in 3G areas. Also, they don’t have the large color screen with buttons for navigation and system configuration. Even if you use a Verizon mobile WiFi hotspot as described above, you’ll still have some limitations with your non-Verizon phone. For example, although the data will work, and you can make outbound calls with Skype, any inbound phone calls or SMS text messages won’t come through (although, Apple iMessage still works). a Verizon Mobile WiFi Hotspot. As of 7 Mar 2017, the latest technology for SSD drives is the Crucial MX300. Click the size offerings below for the product page. Click here for the latest solid state drive offerings. The information below was current as of 2015 and remains here for reference purposes. There are many 2.5″ solid state hard drives available. Crucial offers an excellent selection of solid state drives that offer speed, value, and reliability. The MX200 also has many other reliability and security features included. The images below are for the BX100 but are similar to the MX200. 7 Mar 2017 at 8:54 AM CST. The models and pricing were updated on 7 Mar 2017. 23 Feb 2015 at 8:59 PM CST. This document was first published on 23 Feb 2015. Most Internet service providers offer customers the option to purchase their own modem or rent one for a monthly fee. Renting for a year is sometimes the same cost as purchasing a unit. This article describes cable modem and DSL modem options. Renting can be more economical if you have several service calls per year, because your service provider is able to perform remote diagnostics or even come on-site to resolve any hardware issues with the equipment. Otherwise, you’ll be paying someone to come and diagnose problems with equipment. If you feel a purchased unit will be easy to setup and keep working, without any hardware failures, then purchasing a unit should be fine. One option is to rent a modem, but purchase your own wireless router. This gives you the ability to purchase a very high quality wireless router independent from the modem. A dedicated wireless router may have more features, speed, and range than a combination modem/router. There’s a wide range of price from as low as about $40 to as much as $300 or more for a high-end wireless router. Having a combined modem/router is nice because you can interact with a single interface to setup the unit and not worry about compatibility between the units. If you’re renting the equipment, your service provider can remotely diagnose problems more easily and they will be more familiar with a unit they are providing. It’s understandable that companies want to and need to recuperate the cost of providing customer service and support. If a product is being rented, part of the rental fee is for providing the support needed when customers have questions about setup or use of their device. No company can hire employees to provide free phone support all day for products they haven’t sold or profited from. Those wanting free and unlimited support for their hardware should rent it from the support provider. Here are a few cable modems with wireless routers built-in.